Verizon today announced (via Re/code) that it is planning on dropping the price of most of its More Everything data plans by $10 per month, making its service offerings more appealing in the increasingly competitive cellular market. Verizon's 1GB data plan is now priced at $30 instead of $40, and a 2GB plan is priced at $40 instead of 50. Price drops extend all the way up to 8GB, available for $85 rather than $90, and there's also a $10 price cut on the company's highest tier 20GB plan, which is now available for $140 instead of $150. The revamped pricing tiers are available to both new customers and existing customers, but current Verizon subscribers must go to the MyVerizon site on Thursday to opt in to a new plan to get the discount as their bills will not be updated automatically. Verizon's price cuts follow continued efforts by T-Mobile to shake up the mobile industry. T-Mobile has introduced a range of Un-Carrier options since 2013, uncoupling device costs from service costs, paying early termination fees, and more. Most recently, T-Mobile announced a "Data Stash" program that allows customers to save unused data for up to 12 months. Sprint has also been offering aggressive promotions and discounts in an effort to draw customers from AT&T and Verizon. I loathe Verizon, but it's great to see that clearly T-Mobile's vision of the industry is having positive, baby-step progress for everyone, not just their own. It's better than nothing, but this is Verizon's response to AT&T and T-Mobile? Pitiful. OK AT&T time for another change. What are you prepared to do? am I reading this correctly? 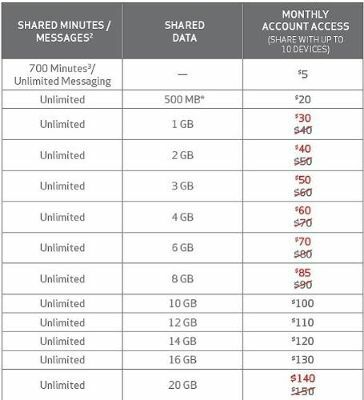 You can get 700 minutes and unlimited messaging and 1GB of data for $35/month? what am I missing here? These are only the 'Data plans' you then have to pay per line for 'Line Access'. Pick the $30/mo 1GB 'data plan'. Then you have to add smartphone lines at $40/mo each. So 1GB becomes $70/mo +taxes and +fees for a single person. It's still too expensive and there isn't an unlimited option. No thanks. It seems that they dropped the price on the plans that probably have the least amount of users. My guess is that the majority of phone users are in the 8 to 16 gig range interms of the service they sign up for. Again, my guess is that this group makes up well north of 80 percent of users. So the price drop shoud not really impact their revenue. Another way of putting it is that this was just a media attention grabbing move. Okay...it should be free or like $5. Not $30. Talk about stealing. Well, free is never going to happen unless the US government starts allow EBT to be used to pay for your cell service, otherwise, the carriers aren't in the business of giving things for free. You're paying for a service, not just the data. It's a convenience you're paying for. At the end of the day, though, I agree that $30 for 1GB is no value. Correct. The current/new promo is with prices dropping on the lower data plans (while the previous promo was with prices dropping on some higher data plans).